Being a great admirer of past, to bring together old pictures from all the available sources has become a kind of ardor for me. The old pictures not only provide us information about our past but serves also as a bridge to block up a huge bay between the precedents and current. I have got this picture at http://oldindianphotos.blogspot.com. 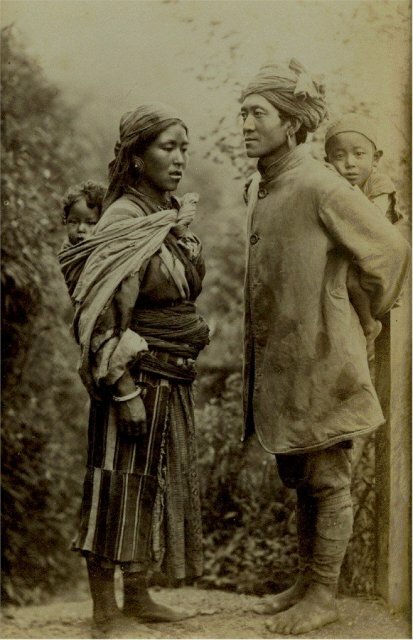 The picture with this post belongs to an unknown Tibetan family probably taken by some British Officials during their stay at Darjeeling or in some other parts of the Himalayas. The most important feature for me in this picture is the apparel of the Tibetan family. The lady is wearing a typical Tibetan dress (Bakkhu and Hanju) and her male counterpart is wearing a dress which does not bear a Tibetan feature. The upper garment he is wearing is a woolen Coat generally worn by the North Indians and the lower garment looks like a Suruwal of the Nepalese. Another interesting thing here is a turban worn by the male member which also was not a part of the Tibetan culture. Turbans were in vogue in India since Ancient period and even today it is greatly admired by rural India. I have never seen any Tibetans wearing such attire in Sikkim or Darjeeling. Even during their exile in India they are wearing their traditional attire with the same pride as it had in Tibet. The divergent feature of the picture puts me in a confusion to reach to a tangible conclusion. So what was it? Was it an acculturation?